“At approximately 1823 hours, the 4th District received a call for the sounds of gunshots in the 5000 b/o 5th Street N.W. Upon MPD arrival, members discovered shell casings on the street and one on the front porch of a house in the 5000 b/o 5th Street N.W. A closer examination of the shell casings revealed that the shells in the street were a different caliber from the shell casing located on the front porch. 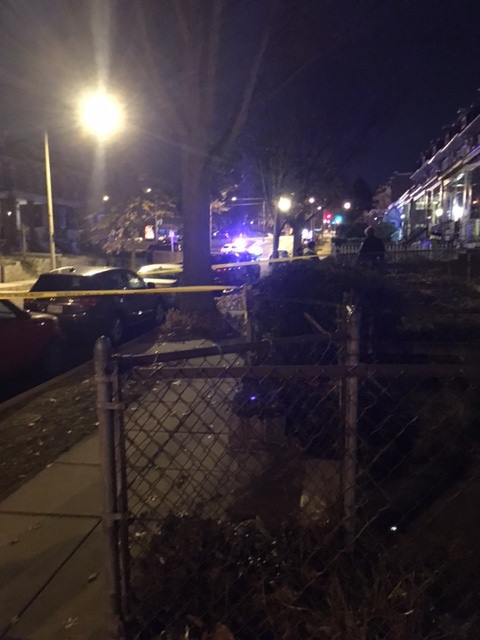 4th District members canvassed the area for witnesses and learned that a group of individuals were sitting on the front porch of the house in the 5000 b/o 5th Street N.W. One of the individuals on the porch, who also lives at the location, was identified. While this individual and his friends were on the porch, another male or group of males approached on foot. Words were exchanged and shots were fired. We believe at this time that an individual on the porch exchanged gun fire with the individual(s) on the street due to the location of the shell casings found and different calibers. Detectives are interviewing the person on the porch who lives at the location at this time. The individual is being very uncooperative.